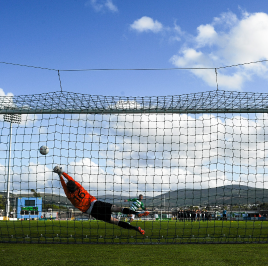 The 21-year-old Mayo native was solid in a scoreless 120 minutes and then came to the fore by stopping spot-kicks from Galway duo Jake Keegan and Andy O’Connell in the shoot-out. Ironically, it was an endorsement from a Galway cup legend Johnny Glynn that helped to persuade the Saints boss to sign a netminder who spent his teenage years with clubs in Galway. “Johnny said to me that ‘this fella has got nerves of steel’ and he’s a top goalkeeper, he’s top-notch,” said Buckley. “He’s got a very bright future in the same bracket as Chris Forrester or any of those other players who’ve moved on. I think he’s got all the attributes, he’s a big lad and will strengthen up.” O’Malley spent last year with the Shamrock Rovers ‘B’ team and an influence in his switch to Dublin 8 was the fact that the maths student also played college football for a NUI Maynooth team coached by Saints stalwarts Ger O’Brien and Brendan Clarke. The latter is now his rival for a first-team spot and a training injury has let O’Malley back in. On the balance of play, the Saints deserved to take home a trophy which was low down their list of priorities at the start of 2015. Victory completes the full set of domestic trophies during Buckley’s second stint in charge, and the manager feels they’ve earned a break.